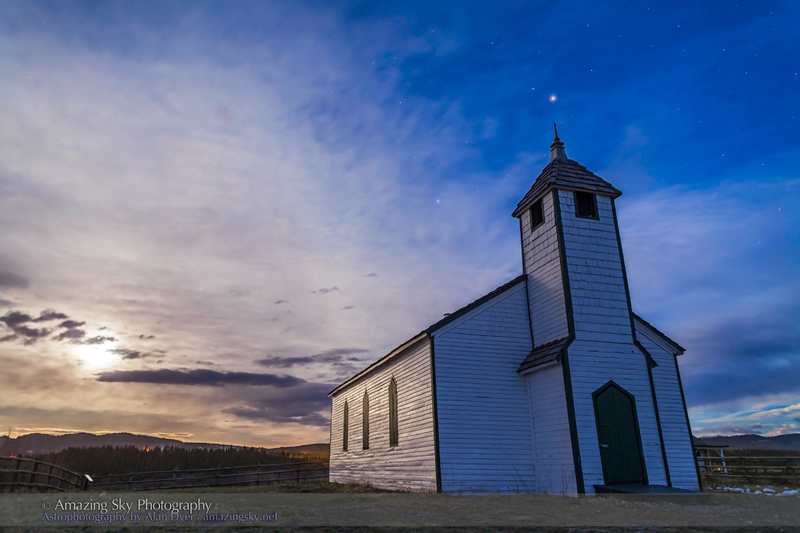 The historic pioneer church at Morley, Alberta stands under moonlight on the banks of the Bow. 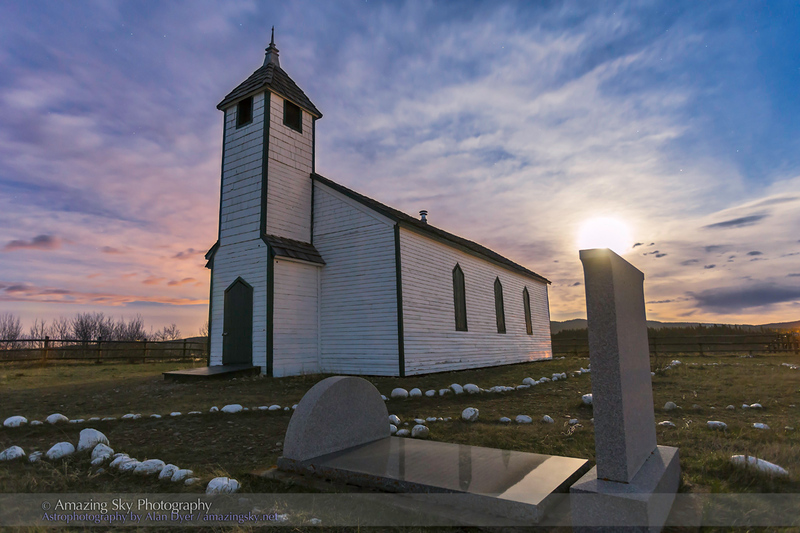 Last night, after presenting a talk on time-lapse techniques to the Cochrane Camera Club, I headed west on Highway 1A to the historic McDougall Memorial United Church, long on my target list for time-lapse photography. It was Full Moon, which helped mask the lighting from nearby town lights and the urban sky glow of Cochrane and Calgary. The wooden church stands on the benchlands north of the Bow River, near Morley, Alberta. Rev. George McDougall built it in 1875 to minister to the Cree. He lies buried on the Church grounds — that’s his grave in the foreground in the main image above, with the Full Moon shining above the headstone. In this image, Mars stands directly above the Church steeple. The Full Moon shines in the clouds to the south. 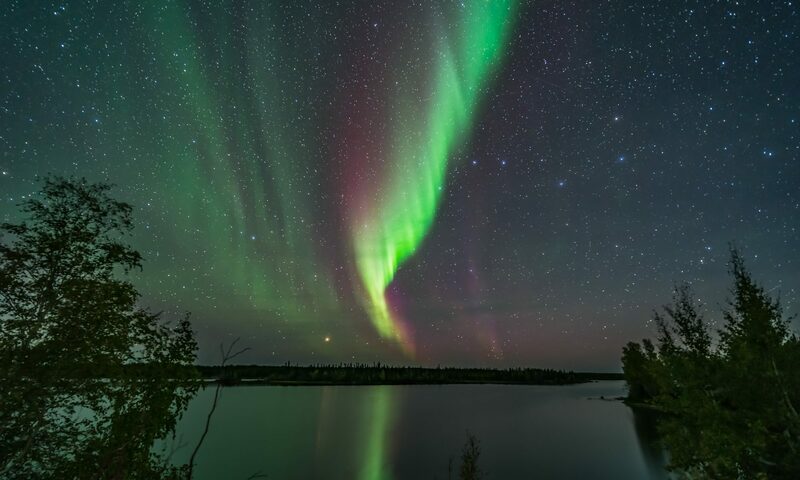 Both still images are frames from time-lapse movies, shot with two cameras. One was on the Dynamic Perception Stage Zero dolly, the other was a static tripod-mounted camera. This little compilation shows the movies I shot last night, under moonlight on the banks of the Bow. It may take a moment to load. I hope you enjoy it! Alan: Did you see the ghost at McDougall church? Thanks again for an informative workshop at Carstairs..The night I went to McDougall, the clouds were moving at high speeds. I am going to have to try time lapse one day soon. No ghosts revealed themselves. One would have been a great added feature in the time lapses.